Japanese and North Korean officials have held talks in Pyongyang for the first time in a decade to discuss the abduction of Japanese citizens. North Korea has admitted it kidnapped 13 Japanese citizens in the 1970s-80s to train spies in Japanese customs. Five of them were returned to Japan in 2002. Pyongyang says the other eight died. But Japan does not believe this and it also believes more people were abducted. Japan and North Korea have no formal ties partly because of this history. 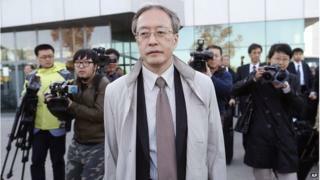 A first report on the probe was expected in late summer or early autumn, according to Kyodo news agency. But North Korea said it could not provide enough information by that deadline and no report was given. The BBC's Rupert Wingfield-Hayes in Tokyo says Prime Minister Shinzo Abe may now be hoping a high-level delegation can make a breakthrough. The Japanese government believes North Korea kidnapped 17 of its citizens in total. Five of them were repatriated in 2002. North Korea claimed at that time that the others had either died or never entered the country to begin with, an assertion which sparked outrage in Japan. Japan has never accepted this, saying it wants more evidence including the remains of the dead. Japan's Chief Cabinet Secretary Yoshihide Suga told reporters on Monday: "We plan to use this visit to Pyongyang to tell the person in charge that Japan regards the abduction issue as a priority." "We want them to explain the status of the investigation. At this meeting, we will call on them to carry out the probe swiftly and be sincere in their response to Japan," he said. Officials from both sides last met in September to discuss the issue in China. The issue is a priority for Japan because of high-profile cases such as Megumi Yokota, who was taken by North Korean agents on her way home from school in 1977 when she was 13. North Korea said she killed herself in 1994, after marrying a South Korean abductee and having a daughter. In 2004, North Korea returned what officials claimed were her remains but DNA tests showed they did not belong to Ms Yokota. Her parents have campaigned for years to find out what happened to her.